Raphael Schnepf. Contemporary Renaissance Artist. You learn a lot about someone over a lifetime of creative endeavors in this journey we call life. Raphael, or “Raf” to his friends, has been a dear friend of mine and inspiration since our first encounter when we were introduced by our mutual friend, artist Michael Cacy in the late 1980’s. Back then I was painting the larger-than-life Hollywood Video murals. Raf was creating beautifully detailed airbrushed illustrations. Creatively speaking, our work could not have been further apart really, yet hugely similar in so many ways. Back then, before computers ruled, the airbrush was the tool of choice. Everything was created by hand. That was the similarity in art we both shared as we had a mutual respect for each others work. I loved Raf’s art, as I still do. It didn’t take long for us to become good friends, and in hardly no time we were sharing our airbrush knowledge with each other. It wasn’t long after that that we combined our mutual knowledge and love for art by combining our skills to teach students in workshops together. Captain Beefheart & His Magic Band ~ The Doors Poster — poster art, circa 1960’s. Long before Photoshop filters, artists were creating colorful poster art the old-fashioned way – by hand. Raphael was a pioneer in the rock art poster era, creating fantastic creations in bold psychedelic colors and sharing the gospel of rock ‘n roll and keeping company with the infamous Haight-Ashbury scene. Avalon Ballroom Poster — poster art, circa 1960’s. Morning — oil on panel. Over the years I’ve been privileged to know Raf and his beautiful family and friends. A decade ago I was honored to be best man at his wedding to his lady Margaret. Years later, I still marvel at his prolific nature and creative energy as he continues to produce beautiful art in a variety of mediums. You see, Raf’s art extends well beyond airbrush, or any single medium for that matter. His free-flowing hand lettering is fluid and inspiring. His figurative artworks still move me. His glass work is pretty awesome as well. And I’m sure there are are a variety of creative expressions that I shall fall short of listing here. As you might imagine, it would be nearly impossible to celebrate his nearly 50 years of creations in a single post. Clearly, I’m a fan of his work as a contemporary renaissance artist, and master of many mediums. I am especially honored to share Raphael Schnepf’s art and talents with you here as my Featured Artist of the Month. Heat — acrylic on canvas. Motor Lisa — acrylic and oils on canvas. Mona Lisa, Mona Lisa. MOTOR LISA was a fun collaborative project that Raphael and I worked on together in 2002. Watch for a special post on her soon. It’ll share the real reason Mona smiles. Jamaica — original creation on glass. Raphael is renown for his fantastic glass creations. 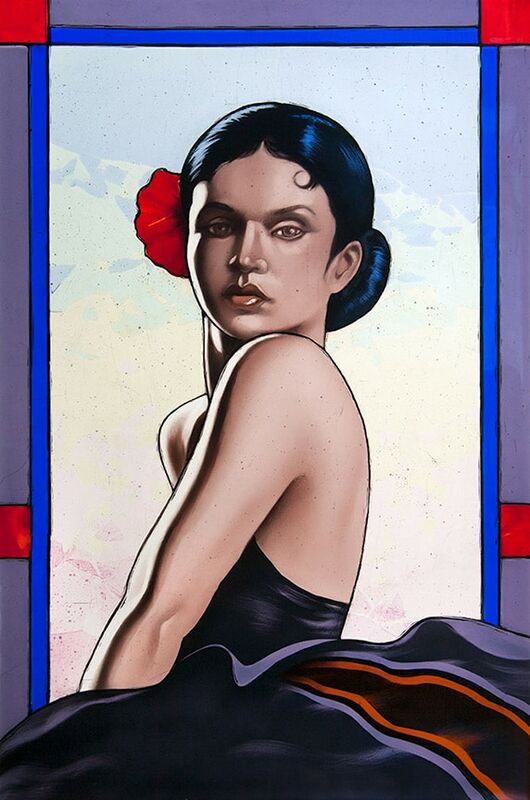 Going beyond the basics of stain glass, the artist incorporates a plethora of techniques including airbrush and multiple sessions in the kiln. Flamingo — original creation on glass. 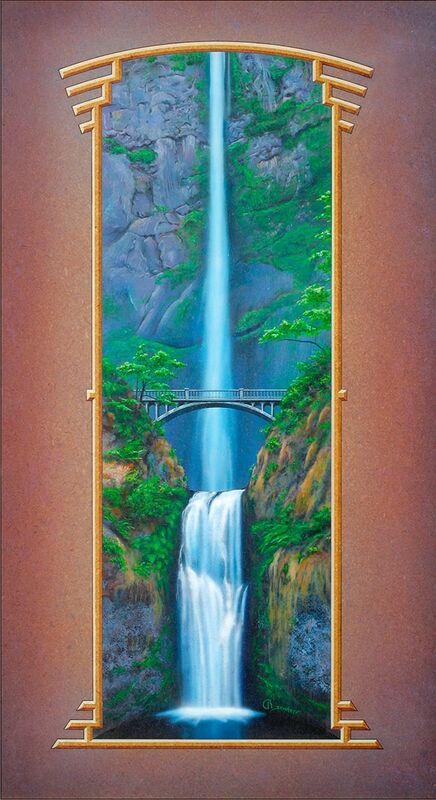 Multnomah Falls — original painting on panel. His Multnomah Falls painting of the beautiful waterfall in Oregon is among one of my favorites. So much so that the original is among my personal collection. 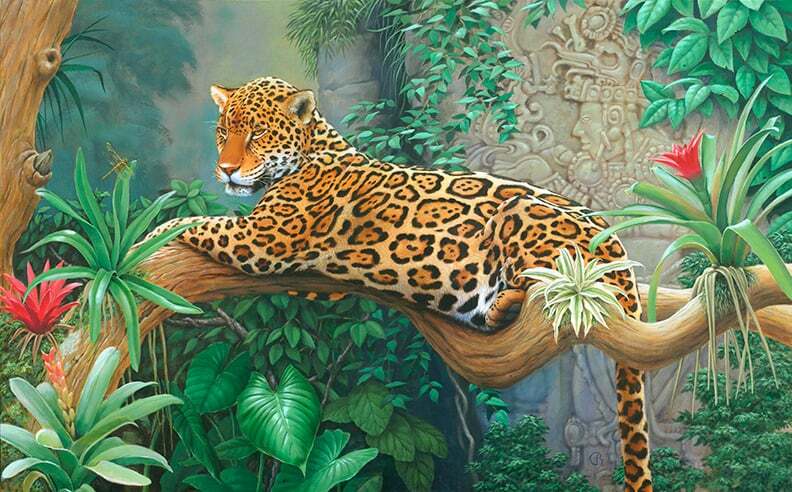 I’ve marveled at this painting for many an hour. Every time I see it, it reminds me of home. This painting exudes detail, stunning craftmanship and passion. Beautiful work raf. 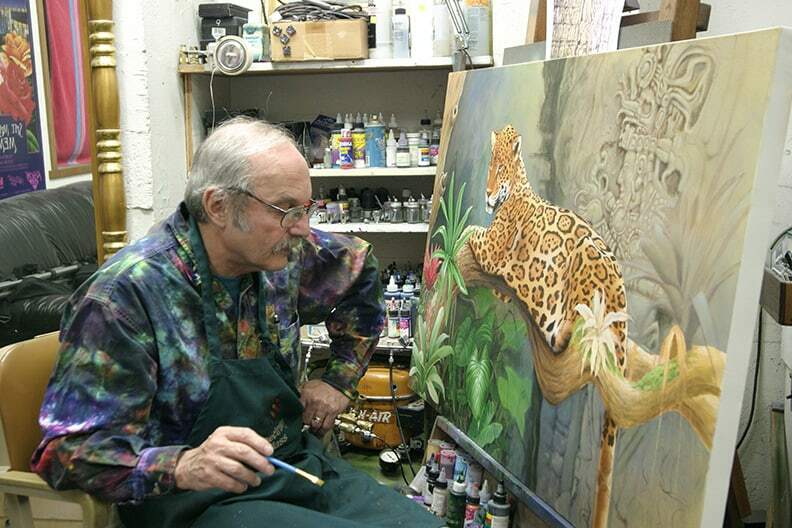 Artist Raphael Schnepf at the easel. 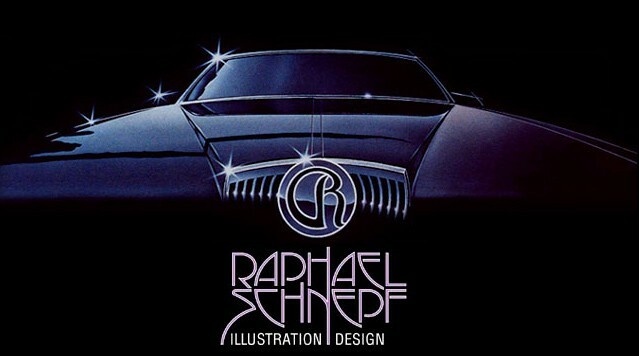 Raphael Schnepf has been on the Art scene since he graduated from New York’s High School of Industrial Art in 1954. After a brief tour with the Navy as a photographer, he went on to graduate from Cooper Union Art school in New York and completed his B.F.A. at the San Francisco Art Institute. 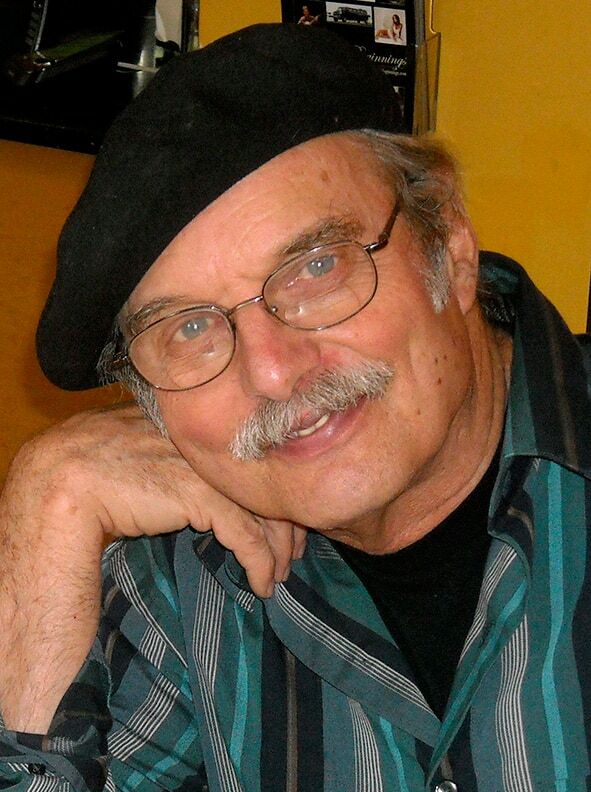 In 1965, he became active in the emerging San Francisco counterculture, creating psychedelic paintings, post cards, drawings, music posters and illustrations. 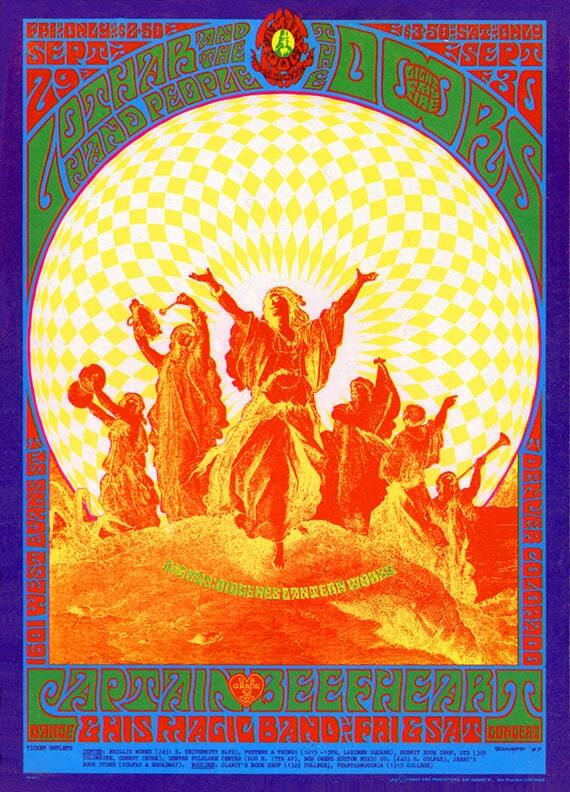 After seeing his poster for the 1967 Summer of Love, the Family Dog commissioned the first of seven posters Raphael was to create in ’67 and ’68. This led to commissions for a comic book for the band “Canned Heat”, record jackets, more posters and illustrations. During the 70’s, Raphael continued to explore new mediums. After rediscovering the airbrush, he developed a photo-real style, creating images for book jackets, record jackets, murals, packaging, and posters. In the late 70’s, Raphael joined with Savoy Studio as a designer and glass painter on many revolutionary glass projects. 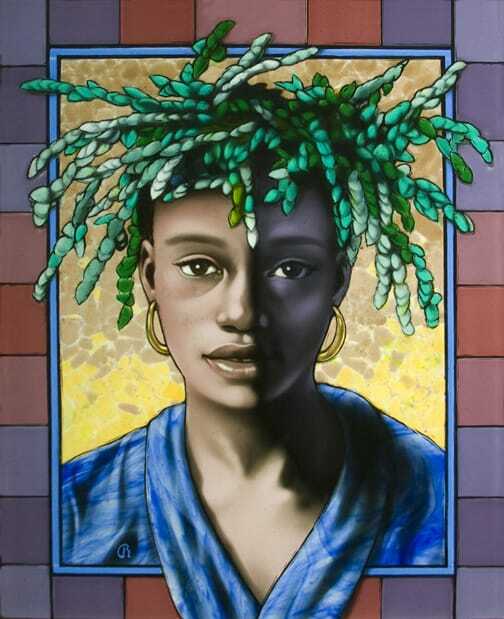 In 1986, he moved with Savoy to Portland, Oregon to continue the collaboration as well as his own fine art, design and illustration career. He has worked for clients like Intel, Techtronix, Nike, Precision Castparts and Grateful Dead, always seeking out poster commissions as well. In the 90’s he continued to work with Savoy on major glass projects for architectural installations across the nation. Raphael’s work has been in many publications such as “A Concise History of Posters”, “Eureka” and “The Art of Rock.” His work has been shown in the Museums of Modern Art in New York, San Francisco, Denver and San Diego. Raphael has been working on a series of fused and painted glass portraits and nature scenes and recently began doing more immediate oil studies in the manor of plein air painting. All images above are copyright © Raphael Schnepf. Shared by permission.